This tasty Grilled Caesar Salad with Prosciutto di Parma warm your soul and ignite your taste buds. 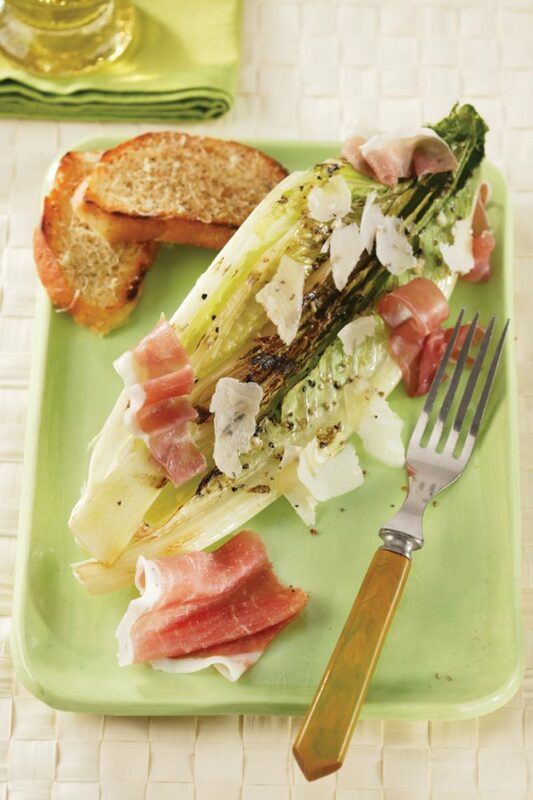 Enjoy the warm, crispy romaine with the creamy richness of Prosciutto di Parma and Parmigiano Reggiano. There’s no better or tastier way to get in your greens than salad with prosciutto, so whip up this dish for a simple, yet sophisticated first course or light lunch. Heat a nonstick grill pan over medium-high heat. Combine olive oil, vinegar, garlic, salt and pepper in a small bowl. Brush romaine on both sides with the vinaigrette. Place each romaine heart half cut side down on the grill pan. Grill on both sides for 1 to 2 minutes, or until wilted and grill marks form on the bottom. Sprinkle Prosciutto di Parma ribbons and Parmigiano-Reggiano shavings over grilled romaine hearts and serve immediately with Parmigiano Reggiano croutes and remaining vinaigrette.